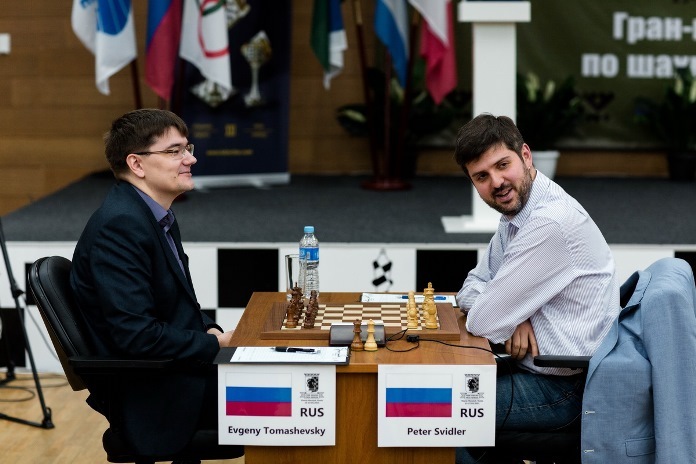 Despite two wins in Khanty-Mansiysk on Sunday – for Tomashesky over Svidler and Giri over Jobava – the real excitement was focused on two extraordinary games that ended in stalemate. 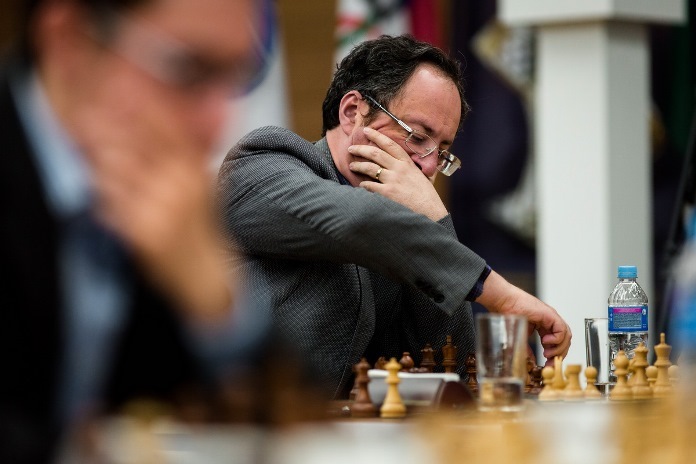 Boris Gelfand pulled off an escape of epic proportions against Dmitry Jakovenko, while Caruana-Karjakin was mired in controversy when the game continued after both players had signed off on an incorrect draw by repetition. 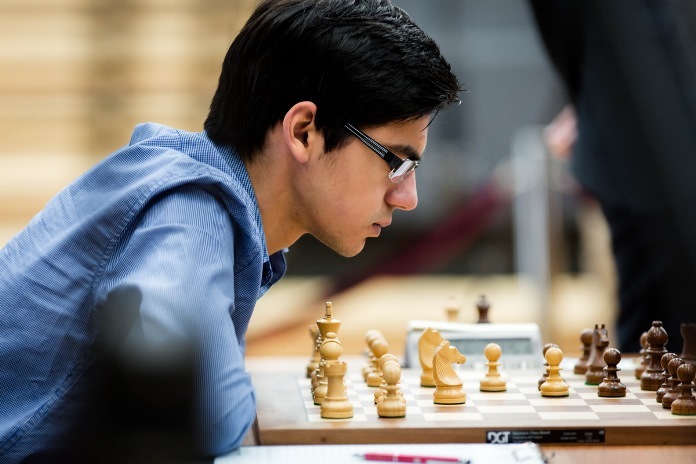 Round 9 of the Khanty-Mansiysk FIDE Grand Prix left the standings at the top of the tournament unchanged. Hikaru Nakamura remains in the joint lead after a 31-move draw against Alexander Grischuk’s Grünfeld Defence in a game that never swung in either side’s favour. Joint leader Leinier Dominguez also drew with White against Maxime Vachier-Lagrave in only 28 moves, though after that game the players’ catchword in the press conference was “unclear”. It was a false claim, since in fact the Black king was on c6, not e6, before those first two moves, but nevertheless the claim was accepted by the Deputy Arbiter from Hong Kong, Kwai Keong Chan. The confusion was caused by the ambiguous recording of 36…Kc6 on Karjakin’s scoresheet. I was sure it wasn’t a repetition, but then I suddenly got confused when we started to check the position on the board and I became convinced that it was a repetition. Then we signed for a draw and I was pretty upset that I had signed and then for some reason the arbiter told us to change the decision and play on, which was a little strange, but I was happy to play on. By that point Fabiano had signed the scoresheet and after that I think the arbiter didn’t have the right to continue the game. Actually I accepted the arbiter’s initial decision for it to be a draw, but then he asked me if I wanted to play and I said yes. I asked Caruana, “do you agree?” It seems they both agreed, after which they both signed Sergey’s scoresheet. But suddenly Chan, sweating, rushed up and said: “I made a mistake – there’s no repetition”. It turned out that first Karjakin and then he had incorrectly understood the notation for Black’s 36th move: 36…Kc6. The letters “c” and “e” are very similar, and if the king had been on e6 then there really would have been a 3-fold repetition. So that was the misunderstanding that arose. I asked Caruana if he agreed to nevertheless draw the game, but Fabiano was silent. Then I recalled what I’d been taught sixty years ago when I was just starting out as an arbiter – if you make a mistake you can correct it. And I said: “Continue playing”. That was my decision as Chief Arbiter. Neither player objected and play went on. It's clear the arbiter can alter the result on a scoresheet, but not whether he can allow the game to continue after it "concluded". Let's briefly return to more standard chess action! All of his variations are not as bad as they look, and the computer usually doesn’t understand them. Jobava played the “very, very risky move” (Giri) 19…Rf5? after only 6 seconds, and was then surprised by 20.f4! – “If I saw this f4 move I would play Bf5 without thinking”. It seems that wasn’t the only refutation of Black’s idea, but in any case the game still went on until 20…Bb5 21.Qxf5 d3+ 22.Rf2 Rf8 23.Bxd3 Rxf5 24.Bxf5 was followed by 24…Qe3?? It’s not a blunder… I don’t know what it is! At least after that strange game the players seemed to get on well in the post-game press conference, with no repeat of their Tashkent meltdown. The other win was a third consecutive loss for Peter Svidler. 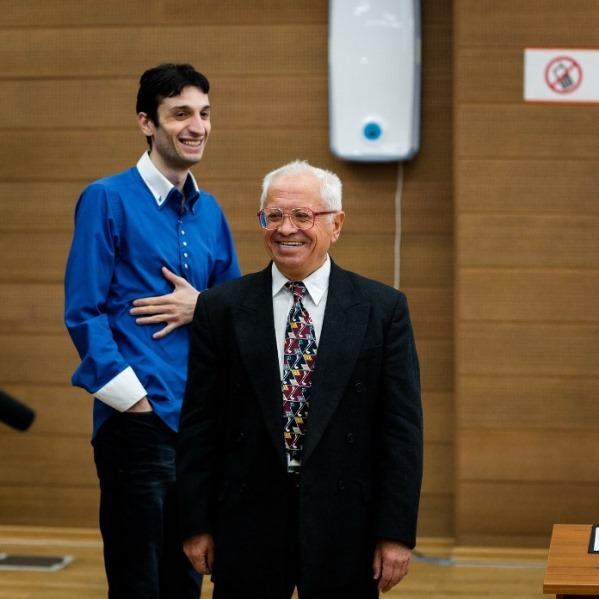 His opponent, Evgeny Tomashevsky, played the more aggressive 13…Bc6 rather than the 13…Bc8 he’d lost with against Anish Giri in Round 7, but Svidler had no explanation for why he spent 25 minutes – and more in the coming moves – thinking about something he’d looked at in detail over the rest day. Black was soon doing well, but it was only on move 23 that things started to crumble for Svidler. He played 23.Bxc4?! and admitted he’d simply missed when going for this position that Black could play 23…Qa7+! immediately. 23.d4 would have retained a healthy position. Instead Tomashevsky could even afford to miss a clear win in the run-up to the time control and still have enough of an edge that Svidler concluded “there’s no need to prolong this suffering” on move 42. The final game was the highlight of the round, and the best rebuttal of Nigel Short’s dislike of the stalemate rule. Gelfand and his second Alexander Huzman had analysed the position and concluded he had to take a draw with 24…Qd7, but instead, after 30 minutes’ thought, Boris tried 24…Nd7?, only to conclude that after 25.Re4! “basically I have to resign”. 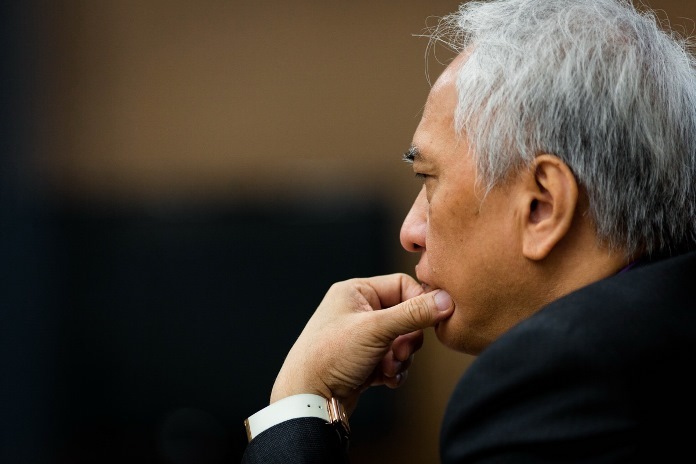 We have to be grateful for the decision, and also the choice not to resign on the spot. Instead it wasn’t easy for Dmitry Jakovenko to find a knockout blow, and when he was already in time trouble Gelfand began to play on the fact that the black king had no squares it could move to, with the bold 45…Nd3?!! and later 48…g4! A beautiful final position to end this report! That meant that Dmitry Jakovenko had missed a big chance to make himself a real contender for Candidates Tournament qualification. Evgeny Tomashevsky’s win could still be significant (he’s third highest below Caruana and Nakamura in the overall Grand Prix standings), though he needs to win at least one and probably both of his final games to have a decent chance of upsetting his higher-rated rivals. 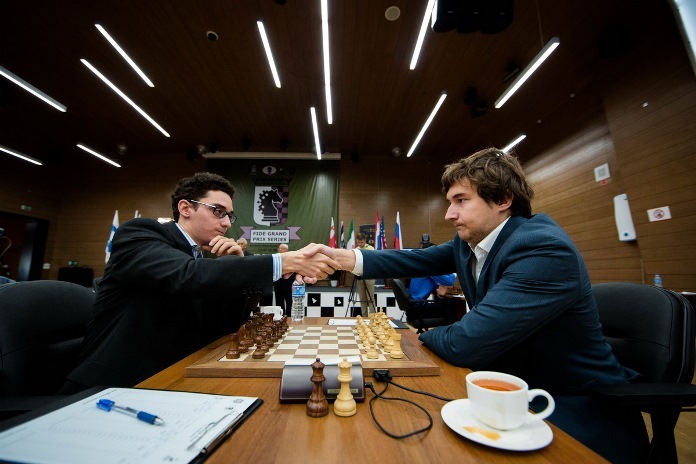 Gelfand – Tomashevsky will therefore be one game to watch in Round 10, while Caruana – Nakamura will be intriguing. Will both players be happy with a draw or will one of them go for a knockout blow to confirm qualification? Don't miss the action live here on chess24! Khanty-Mansiysk Grand Prix, Round 2: Unpredictable! Grand Prixview: What's at stake in Khanty?